Richard Petersen, OD, is a skilled and highly regarded doctor of optometry at Antelope Valley Optometric Center in Lancaster, California. Dr. Petersen specializes in comprehensive vision exams, contact lenses, eyeglasses, LASIK surgery co-management, eye care for children, and treatment of eye conditions like macular degeneration and astigmatism, as well as retinal diseases. After beginning his education at Antelope Valley College, Dr. Petersen attended the University of California, Berkeley to complete his undergraduate degree. Dr. Petersen then worked as an optometric technician at Antelope Valley Optometric Center to gain valuable experience in optometry before attending the UC Berkeley School of Optometry, where he earned his doctor of optometry degree. Upon becoming an optometrist in 2006, Dr. Petersen rejoined the Antelope Valley Optometric Center. 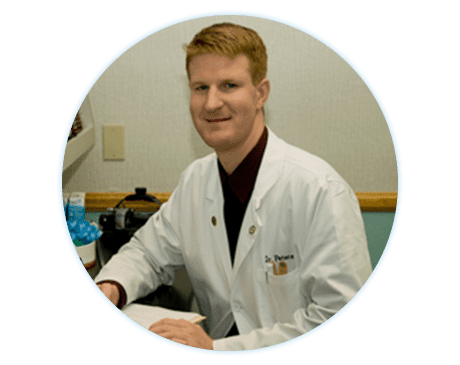 Dr. Petersen loves his work at Antelope Valley Optometric Center, and he’s passionate about helping patients with all of their eye care needs. When not assisting his patients, Dr. Petersen enjoys spending time with his wife and three dogs, cooking, and staying up with the latest events in the world of sports. Antelope Valley Optometric Center accepts most major insurance plans. Here is just a short list of a few of the major insurance plans we accept. If you do not see your insurance plan listed please contact our office.